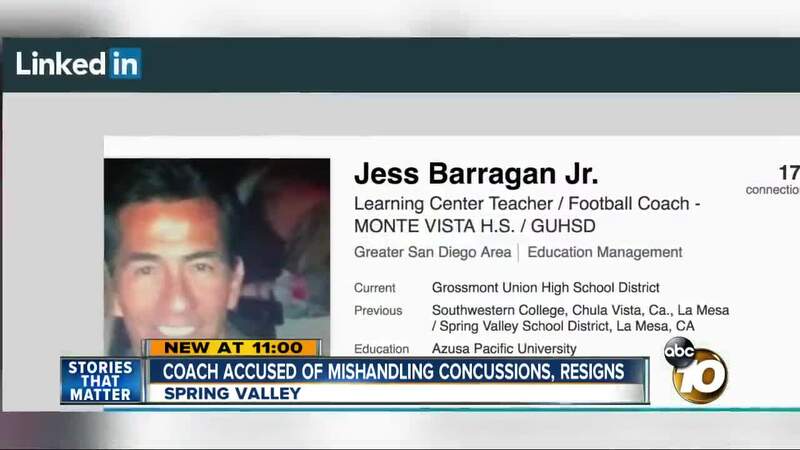 SPRING VALLEY (KGTV) -- A Monte Vista football coach previously involved in a concussion lawsuit has resigned after another football player was injured during last Thursday night’s game. In a statement to 10News, the high school confirmed that, during the game, a player self-reported a potential concussion to the school’s athletic trainer. The head football coach, Jess Barragan, was notified and the student then reportedly walked home. The athlete’s family wasn’t contacted about the injury. Following the game, the school says Barragan decided to resign effective October 2. Barragan was involved in a previously-settled concussion lawsuit which was sparked after a player, Rashaun Council, took a hit on the field. The 19-year-old former honor student and two-sport athlete’s life was changed forever during a football game on October 17, 2013. At the time, Council was playing for the Monte Vista High School freshman football team. The lawsuit stated that his coaches failed to alert medical personnel. According to the family's attorney, Brian Gonzales, Council complained he didn't feel well. The teen ended up back on the field and, after the game, began vomiting before collapsing. Council was suffering from a concussion and had a subdural hematoma. He would spend the next eight months in the hospital. Now, he’s unable to drive and still has difficulty walking and communicating. The family settled their lawsuit with the Grossmont Union High School District for about $7.1 million. The family also settled a lawsuit with helmet maker Riddell for an undisclosed amount.